The home secretary David Blunkett is to present Parliament with proposals for a national system of identity cards. BBC News Online looks at how the scheme might work. Why is the government so keen on these cards? The government thinks such a card would be a powerful way of fighting terrorism, illegal immigration and benefit fraud. It would also be a way of checking the entitlement of an individual to receive services and benefits, including welfare payments and treatment under the NHS. But the scheme would also be designed to help stop terrorists and organised crime groups using false and multiple identities. Would ID cards be compulsory? The home secretary first raised the issue to the cabinet over two years ago. Ministers backed the plan last November but disagreements within the cabinet delayed a final decision. Mr Blunkett has previously said, at the very least, nobody should be able to work or claim benefits without one. He said people would not have to carry it in the street, but would have to produce it when required by relevant authorities. Mr Blunkett plans to start introducing the cards in 2007 and wants most people to have them by 2011. A decision on making them compulsory would be made in around 2012. As the draft plans stand this would not require separate legislation. But the home affairs select committee argues that in order to fight terrorism, they should be made compulsory. However, even without the card, police could biometrically scan individuals to check they are on a national database. Mr Blunkett said costs of setting up the system over the next three years would be around £200m a year. The total cost is estimated at £3bn. But the detailed cost has been kept confidential to avoid giving to much information to potential bidders, the government says. People will have to pay about £77 for a combined passport identity card, compared to the current £42 charge. The cost of a plain biometric identity card will be about £35. Cards will be free for under 16s. Those on low incomes will pay a reduced rate of about £10. The card would contain basic identification information including a photograph of the card holder, along with their name, address, gender and date of birth. But a microchip would also hold biometric information - a person's fingerprints or iris image which are unique to the individual. From 2007-2008, it will be compulsory for anyone who replaces their passport to have their biometric data taken, such as fingerprints. These details would be stored on a National Identity Register so police and other officials can cross-check the information on the card. The biometric details may prove controversial but are designed to make the cards more difficult to forge. We had ID cards in Britain before. If they are such a good idea, why did we get rid of them? In the dark days of World War II, the ID card was seen as a way of protecting the nation from Nazi spies. But in 1952, Winston Churchill's government scrapped the cards. The feeling was that in peacetime they simply were not needed. In fact they were thought to be hindering the work of the police, because so many people resented being asked to produce a card to prove their identity. What are the other objections? In a country which prides itself on safeguarding the liberty of the individual, there has always been a reluctance in some quarters to accept ID cards. Some critics fear it might cause friction among ethnic minorities and set back race relations if it is misused. There are other fears that the cards would simply drive illegal immigrants into hiding, forcing them to avoid contact with hospitals and police. Among the practical objections is the concern that overseas terrorists could exploit the rule that foreign nationals need the cards only if they are coming to the UK for longer than three months. But this rule only applies to EU nationals. There are concerns about the number of people and organisations who are to have access to the information database provided by the cards. There are also fears the database could be used for other purposes than they were meant. The committee termed this "function creep". And worries about the reliability of biometric technology and errors in using biometric information have been expressed. There are also fears that the cost of the scheme could spiral out of control like so many highly technical government procurement projects. Lots of other countries already have ID cards - aren't we out of touch with the rest of the world? Eleven of the 15 original EU member states now have some form of ID card, even if they are not compulsory. They have become widely accepted by their citizens. In France, for example, about 90% of the population carries one. But many other countries, like Japan, Australia and New Zealand, have not adopted the idea. In the United States, despite the attacks of 11 September, there has been no attempt to persuade people a national ID card would be a weapon in the war against terrorism. The country does intend, however, to make visitors have cards to cover their visas. The strength of public feeling about privacy and personal liberty remains a deterrent to political leaders. The government will eventually require fingerprint or iris biometric technology on all new passports. A bill is expected in the next session of Parliament on passport renewal. Mr Blunkett hopes biometric passports will start being issued over the next three years. 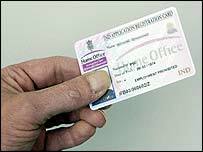 Biometric driving licences are also under consideration.